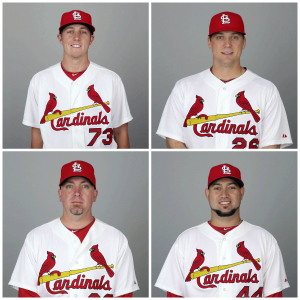 Hey, remember when we panicked over the state of the Cardinals bullpen because things were just awful? Yeah, it was only last week — and the last time Jake Westbrook started — but things have definitely improved. And the bullpen was a big factor in the St. Louis Cardinals 5-4 win over the Chicago Cubs at Wrigley Field yesterday afternoon. A win over the Cubs? Always extra nice, because of the angst just playing the Cubs can cause for us as Cards fans that Tara described yesterday. A win over the Cubs to complete a 5-1 road trip? A 5-1 road trip that increased the Cardinals division lead to three games over the Pittsburgh Pirates and Cincinnati Reds and again gives them the best record in the National League plus the best record in the majors? Time to pause and enjoy on this off day. Because, as well all know, it’s a long and roller-coaster ride of a season. Even individual games like yesterday’s can be emotional roller-coasters — but ones that ultimately end up just fine thanks especially to a 24-year-old rookie who’s thrown all of 18 pitches in his major league career and the three relievers who followed him. Seth Maness, incredibly efficient. No, ridiculously efficient. How ridiculous? How’s this, as Derrick Goold describes in the St. Louis Post-Dispatch? On his first eight pitches in the big leagues, Maness had five outs and a win. On his first 10, he had nine strikes and seven outs. “Is it possible for him to get 100 wins with less than 100 pitches?” ace Adam Wainwright recalled musing with his fellow pitchers on the bench. “I’m not good enough at math for that,” fellow starter Lance Lynn joked. Maness has defied equations by making one equal two, which he did again Wednesday as he coaxed two double plays and pitched 1 2/3 scoreless innings. Crazy … and crazy good. Also good were those who followed him: Trevor Rosenthal, Randy Choate and Edward Mujica (who earned his ninth consecutive save). They combined to allow only one hit while striking out two in their combined two innings after Jon Jay drove in Yadier Molina to give the Cardinals a 5-4 lead in the top of the eighth. Carlos Beltran drove in two runs as well, on three singles. Those were definitely something both sides utilized plenty yesterday. The Cardinals grounded into three of them, with David Freese and Matt Adams also joining in. As mentioned, Maness benefited from two GIDPs by the Cubs, from Dioner Navarro and David DeJesus. Earlier, Jake Westbrook got Starlin Castro to ground into one. And Randy Choate took care of business after giving up a single by inducing a double play from Nate Schierholz. All’s well that ends well, right? Especially against the Cubs at Wrigley Field? So time for the Cardinals to relax and enjoy their second day off this week, while we ponder just what to do with ourselves until they play again tomorrow night at 7:15 p.m. against the Colorado Rockies. Watching Seth Maness highlights is one option … but it certainly won’t take up much time. Christine Coleman is the lead St. Louis Cardinals reporter for Aaron Miles’ Fastball. Follow her on Twitter, @CColeman802, or email aaronmilesfastball@gmail.com. Also follow @AMilesFastball for the latest updates. And the Cardinals’ success to date has been well-earned. They’ve compiled a 21-12 won-loss record in the face of a tough schedule, against teams which have a .533 winning percentage, the second-highest in MLB, right behind Arizona. And their run differential of +42 is the best in the National League, and second only to Detroit in MLB. And May’s schedule appears a lot easier than April’s, especially if the Rockies continue to struggle: they’ve lost 10 of their last 16 games.